Wise Bread put up a splendid list of ideas for using canned salmon. 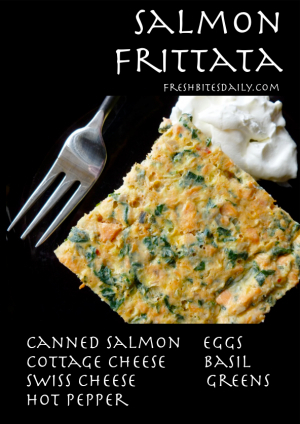 We have tried several of her suggestions and this frittata is a favorite. Nothing is more versatile than a good frittata: Serve it for brunch, lunch, dinner; serve it hot, warm, or cold. 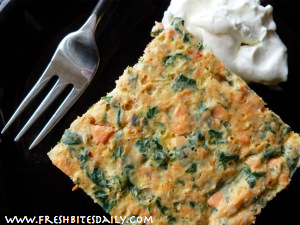 This frittata is full of flavor and protein which means it is tasty as well as satisfying. Feed six to eight people with this recipe. Serve with garden-fresh heirloom tomatoes, sliced and drizzled with olive oil and white wine, salt and pepper. Beautiful colors, bright flavors to accompany the salmon flavors. If you have leftovers, pack them up in the lunch bags. What a treat! Coat the inside of a 9 by 13 inch bake pan with coconut oil and line the bottom with the grated Swiss cheese. Crack the eggs into a large bowl and whip them. Add the salmon, cottage cheese, cooked greens, basil, and pepper flakes. Mix thoroughly. Pour the egg mixture over the Swiss cheese. Bake the frittata until cooked through, somewhere between 45 minutes and an hour. The frittata is done when you stick it with a sharp knife and the knife comes out without egg goo stuck to it. 7 Comments on "Salmon Frittata"
There are very few ways that I enjoy salmon other than just “grilled” or pan saute, but this is one of them. Add a little crem fresh and you have an amazing brunch item! Great recipe! I’m still working on finding recipes using canned salmon, so this is a good suggestion. I like the idea of adding arugula, too– that’s a favorite of ours. To me this recipe is more like a crustless quiche than a frittata, which you start on the range and finish under the broiler. Is the salmon accidently left out of the steps?? Is it me or do the directions to that recipe not include the salmon? At what stage is the salmon mixed in/added to the recipe? The recipe has only been up for six months without salmon being listed in the directions. 🙂 Add it to the eggs with the cottage cheese and greens.